The third race weekend for the IZOD INDYCAR Series in 2012, the series returns to a temporary street circuits for the prestigious Toyota Grand Prix of Long Beach. With Saturday’s qualifying very important on the circuit where passing has proven to be tricky, this year’s time trial preparation for the 85-lap race Sunday would involve a very unusual situation for the IZOD INDYCAR Campaigners using the league‘s lead engine. After two race in the 2012 IZOD INDYCAR Series, the Team Penske has shown off their understanding of the all-new Dallara DW12 race cars as drivers Helio Castroneves and Will Power won the season‘s first events. Team Penske also demonstrated under the new competitive engine formula in the IZOD INDYCAR Series the effectiveness of the Chevrolet power plant. However, heading into the Toyota Grand Prix of Long Beach, all of the 11 competitors using Chevrolet’s Twin-Turbocharged V-6 engines were forced to heed to the advice of manufacturer that would cost them grid position starting the Toyota Grand Prix of Long Beach. Engine changes on the 11 Chevrolet-powered INDYCAR race vehicles would be assessed in Saturday’s qualifying on the 11-turn, 1.968-mile road course in California. Unlike Friday’s track time that was accompanied by a wet and cold day, Saturday was more inviting for the 2012 IZOD INDYCAR competitors as they try to set hot laps on the street course. Due to limited dry track practice, there was still some unknowns for drivers and teams. 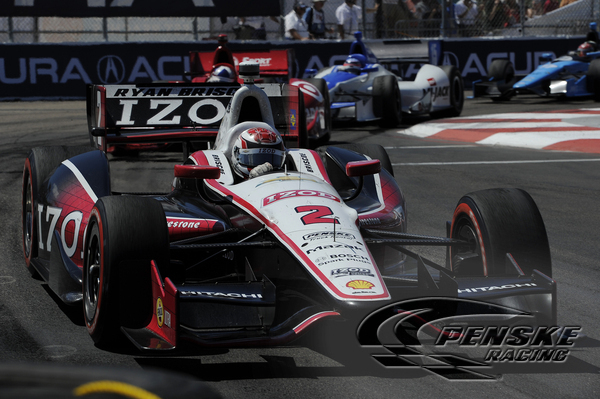 With all 26 IZOD INDYCAR cars posting time, it was Team Penske who again proved victorious during qualifying. Beating all fellow competitors for the first time in 2012, it was the Australian Ryan Briscoe who claimed has first pole since Chicagoland of 2010. Lapping the streets of Long Beach at 1 minute, 8.6089 seconds, Briscoe provides Team penske with three drivers having won a qualifying session for 2012. Briscoe’s winning effort came after a fierce battle on-track with teammate Will Power. Exchanging fastest laps in the final minutes of the Firestone Fast Six qualifying round, Briscoe’s advantage over Power was less than a tenth of a second. Despite Ryan Briscoe having to accept a 10 grid position penalty (dropping him to 10th place for Sunday), the fastest time will count in the points standings where a single point will be rewarded to the Team Penske driver. Another IZOD INDYCAR Series team that scored two cars in the Firestone Fast Six grouping was Andretti Autosport. Andretti Autosport enters the California street course with familiarity on how to get to victory lane after winning the event the past two years. An emotionally-charged 2010 winner of the Toyota Grand Prix of Long Beach, Ryan Hunter-Reay qualified 3rd and teammate Canadian James Hinchcliffe locked in a 6th quickest time. Despite the dominating efforts of Chevrolet in qualifying, the engine change penalties meant the starting line-up would fall to the advantage of the Honda and Lotus powered Dallara race cars. Dario Franchitti, the only non-Chevrolet runner to break into the Firestone Fast Six, collected a 4th fastest run in Saturday’s qualifying. With Chevrolet-engined competitors being demoted, the #10 Target Chip Ganassi Racing receives the top starting spot for the 2012 Toyota Grand Prix of Long Beach. “In the Firestone Fast 6 we knew where we'd be starting regardless of what time we did, but we kind of wanted to earn it.” said Franchitti. Oriol Servia recorded the fastest lap recorded for a Lotus-powered IZOD INDYCAR Dallara DW12 for Dreyer and Reinbold Racing with a 1 minute, 10.6835 second timed trip around the street course. 20th Fastest in time trials, Servia’s and his #22 car will also be assesses their own engine penalty by the sanctioning body that will drop the team to 23rd starting the Long Beach race. The Toyota Grand Prix of Long Beach, race #3 in the 2012 IZOD INDYCAR Series tour, will be set for about 4:15PM Eastern time (1:15PM Pacific time).